I’m happy to see that SAP made the idea become reality. 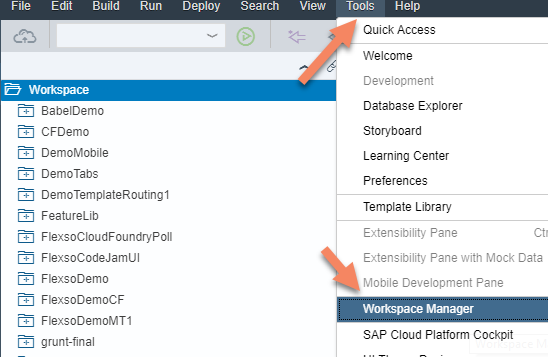 Since the last update you can manage your workspaces in the SAP Web IDE. Here you have the option to switch between workspaces or open them in a new window. It’s also possible to create new workspaces and/or delete them. I really need a clean workspace so I’m going to create a new one with the “Create Workspace” button and give it a name. Let’s open my new workspace. I’m happy that SAP implemented this idea. If you have your own idea, create it on the idea place and maybe it will be implemented one day! Hope you enjoy the workspaces. Great. That was a much needed feature. Great to see user ideas being listened to and implemented by SAP. Nice one… Improving the WebIDE is a must for SAP. As I’m using it not that much over the time I see this one as a step in the right direction. Is it still there, that you should use chrome? I assume this Tools> Workspace Manager feature is there in SAP Web IDE Full stack edition ! Yes – only in the Full stack editiion. The other one is not the focus anymore. 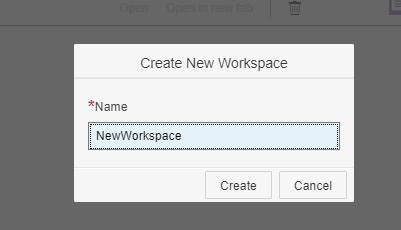 This feature was really needed and it works exactly like Eclipse workspaces. You might have a different combination of settings and plugins activated in each workspace. However, switching from one to other requires a new browser tab to be opened. Personally, I believe it would be better to implement working sets instead of workspaces in order to organize projects. We wouldn’t need to open a different browser tab and all projects would be in the same page. I am new to SAP UI5. Can you guys let me know what is the difference between full stack web IDE and a regular one? How to get the projects from regular to full stack IDE, is that copy and paste or any other way to import. full stack has more focus on full stack development and so it has Cloud Foundry integration, Java IDE and much more. The regular one has more focus on fiori development, less full stack possibilities. You can use export import or git. But their is also a migration process ongoing. I think it’s still in beta but will be available when the full stack will be officially replacing the regular one. very nice feature. One question though, is it possible, or will it be possible, to move an item/project from one workspace to another? Copy/move projects between workspaces is in our plans. We will update the forum once it’s available. This is certainly a useful construct. What is SAP’s advice regarding use of “Workspace Manager” with remote Git repositories? The convention is to have a 1:1 relationship between each app project and remote GIT repository e.g. GitHub. If multiple projects are organised in a Workspace hierarchy, would SAP recommend use of a single remote repository at Workspace folder level, to host multiple app projects ?